Concerned about the quality of the air in your home? Browse AchooAllergy.com's allergy relief products catalog for great allergy relief tips and the best in home care products. Home air purifiers - Researchers tell us that indoor air quality is often worse than outdoor air. That's why AchooAllergy.com� offers a full selection of quality air purifiers for the home. From top-rated HEPA air purifiers from Austin Air to affordable Filtrete air cleaners from 3M, your indoor air will be cleaner and fresher from the very first day you install one of their exceptional home air purifiers. Hypo allergenic mattress covers and pillow covers - An anti- dust mite mattress cover or pillow cover can protect your family from one of the most common home allergens. Their selection of allergy free mattress covers and pillowcases effectively block irritating dust mites from reaching you while you sleep. Even the fabric has been selected for your comfort - their anti - allergy mattress covers won't gather dust or shed lint. Their exclusive brand Allergy Armor� has been recommend by Women's Health magazine. HEPA filter vacuum cleaners - When you compare vacuum cleaners, make sure the one you choose has the power to clean allergens and dust from deep in your carpet, and a filter that traps allergens inside. 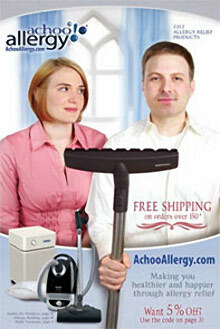 AchooAllergy.com's selection of vacuums has been selected to do just that. Combine one of their HEPA filter vacuums with HEPA air purifiers for the cleanest indoor air possible. Whole house and room dehumidifiers - Reduce mold and mildew with AchooAllergy.com's selection of the best dehumidifiers for all your indoor moisture needs. From a small unit for a damp cabinet, closet or bathroom, to a whole house unit to protect your family from the effects of mildew or mold, they offer the best dehumidifiers for every space. Natural hypoallergenic bedding - You spend one third of your life in bed. If you suffer from allergies, that means hypoallergenic sheets, blankets and other bedding are a must. Check out their selection of non-irritating bedding in comfortable natural fibers, from a hypoallergenic sheet set to hypo allergenic mattress covers. Soothing humidifiers - Relieve the discomfort of winter dry homes with a soothing humidifier. Overly dry indoor air can dry out sensitive nasal passages, leading to discomfort and sore throats. Make your home a more comfortable place to be with an ultrasonic humidifier from AchooAllergy.com. Hypoallergenic organic mattress set choices - If a hypoallergenic mattress cover isn't enough to keep your old mattress from releasing irritating dust and other allergens, consider an organic mattress. Not only will you reduce airborne allergens, but you'll also reduce exposure to toxic chemicals and experience a better night's sleep.